Discussion in 'iOS Tutorials' started by Erel, Oct 9, 2016. AdMob supports ads mediation. 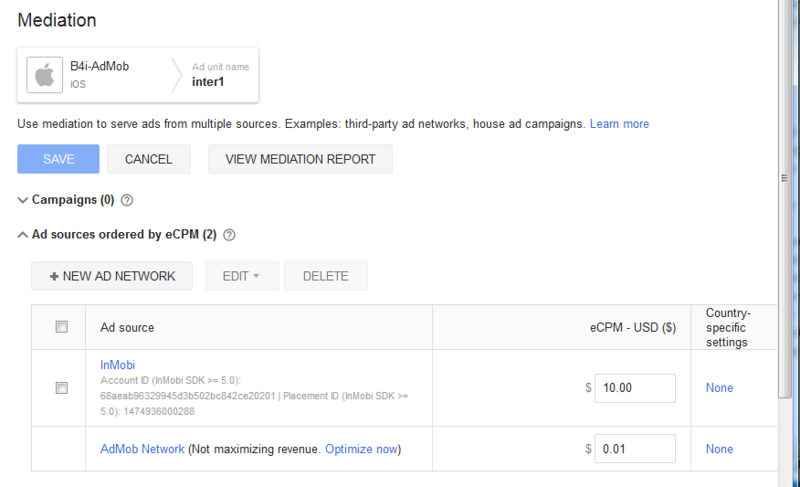 This means that the ad can come from different ad networks and not just from Google AdMob network. It can improve the fill rate and the revenue earned. - You need to register with the ad network, download their SDK and adapter library and copy it to the Mac Libs folder. Note that InMobi libraries are already available in the hosted builder. Note that it takes several hours for any change in AdMob console to be applied. This one hasn't been released yet? Edit: I installed the 3.00 beta. i cant see any option to choose between a different ad network. how can i choose an ad network (in the admob console)? You need to find their mediation setup instructions. maybe this can be added some day? most of the inmobi rewarded video impressions don't even arrive at their console so it's rather useless through mediation. and chartboost could be a working alternative. I've uploaded their SDK to the hosted builders.